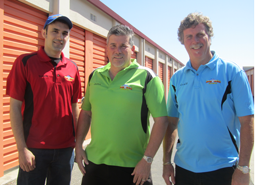 Why use Storage Auction Experts? • On Time Service – In reviewing our records for the last 3 years, we have a 97% show up time that is on SCHEDULE. This comes from years of auction knowledge; knowledge about payment and paperwork processing times, travel time estimates, traffic issues and other variables that effect our show up time. We are ON TIME. This allows both managers and buyers to schedule their day accordingly. • We use a 2nd person at our auctions, 95% of the time, included. What are the advantages in that? Timely collection of payment and a rapid final settlement. Additionally, the ability to easily talk with buyers and management during the auction, providing everyone with the best customer service in the industry. We collect payment as we go, freeing up the facilities and the buyers at the end of the auction. Other companies settle up in the office at the end of the sale, causing a crowd and forcing buyers into a cramped space, as they elbow their way closer, trying to settle up first. The only people in the office at the end of our auction are our auctioneers and management, therefore freeing up your office space to normal business. • We offer Solutions – Before, during and after the auction, we offer our clients solutions. Since every auction experience is different, we’ve had numerous situations where it was necessary to adjust at the last minute to make the auction a success. Our company has over 30 years of auctioneering experience, and we have found solutions too many varieties of problems we’ve encountered along the way. Once we have completed your auction, we're still available to professionally handle any issues, should they arise. For example, a unique situation occurred in Kingsburg in which a buyer ran a scam to avoid dump fees, piling his garbage in one 20' X 30' unit. When we learned of this, we cleaned the unit out, pressed charges, and recovered all the expenses just shy of $2000.00 in Fresno Superior Court in a lawsuit.